Have you ever been in -22 degree Farenheit temperatures? Well neither have WE! Regardless of this fact, we somehow decided that going to Harbin, China during Christmas would be a great idea…. So let me tell you that both my husband and I are Floridians born and raised. My idea of a blistering cold winter is when it gets to be 40 degrees Farenheit. I like to say that after a year up North, that I know how to dress for the cold, but let’s be honest here, I don’t know the first thing about dressing for warm weather. Just give me a sundress and a pair of flip flops and now you’re talking! Alright, back to this trip to Harbin. So a while back we were discussing where we should go over the long weekend of Christmas and I decide to check skyscanner.com to see what tickets are cheap. Well I see tickets to Harbin are about $150 round trip per person, however, I’m like what is this Harbin place?! So after some google searching, I find out that Harbin is only about 2 hours away and they have these amazing snow and ice sculptures during the winter and they start building them right before Christmas. Of course I’m thinking SCORE!!! we’ve found our spot! So I consult Scott and we say let’s go for it! Keep in mind that at this point I still have not checked the weather forecast…(insert ominous sounding music). Well as we get closer, Scott in his infinite wisdom asks me how cold it is supposed to be in Harbin, so we take a peek and the frightening reality hits us….we’re gonna freeze to death! Never to fear, I immediately decide this is a great time for us to stock up on cold weather gear, I mean this is a matter of life and death! It’s at times like this I’m sure that Scott sees the true value of my super shopping skills. After a lot of research and a lot of Amazon and Gmarket packages, we had new coats, smart wool socks, under layers, beanies, neck warmers, gloves, mittens, heat packs and more! 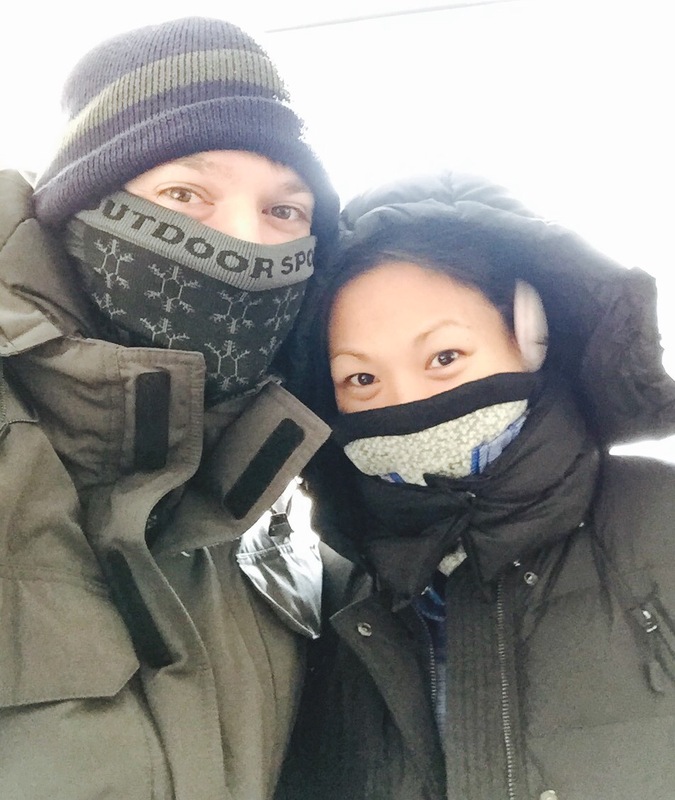 Now we were locked and loaded and ready to brave the cold….or were we…. So here you can see us decked out in our gear, 3 pairs of bottoms, 4 layers of tops, puffy jacket, 2 beanies, neck warmer, ear muffs, gloves, and mittens. Don’t we look warm? So for the site seeing portion of the trip, I decided to hire a driver/guide. Even though I speak fluent Mandarin, I did not want to chance getting stuck somewhere with no ride home and waiting in the cold trying to find a taxi. Now that the trip is over, let me tell you this is one of the wisest things one can do if you’re going to visit Harbin. It was amazing having almost door to “door” service. Alright, so our first stop was to the Songhua River. During the winter this river completely freezes over and they actually cut ice (just like Kristoff and Sven do in the Disney movie Frozen, I bet you never thought that was real huh?!) to build some of the ice sculptures throughout the city. Additionally they have activities like dog sledding, tubing, and ice swimming on the river! 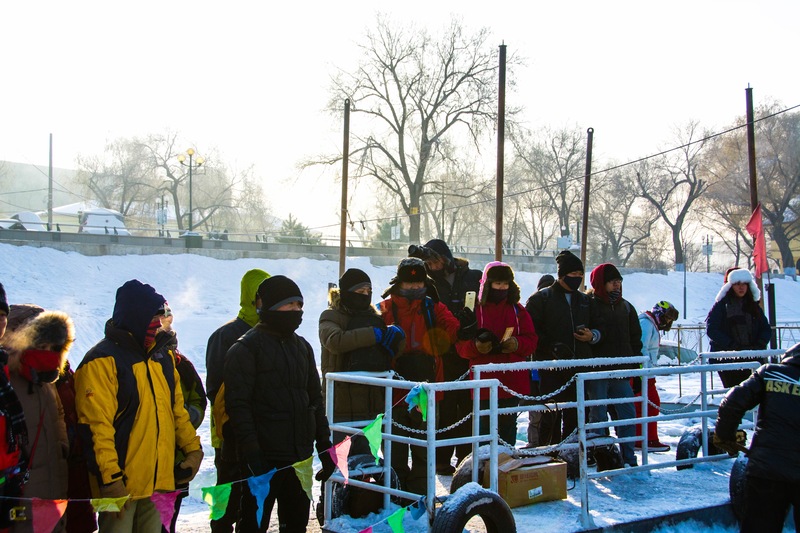 Here you can see the group of people all bundled up watching the ice swimmers take a dip. You might be thinking who in their right mind wants to swim in freezing temps. Well meet some of the swimmers. As you can see they are dressed in swimwear, but they all make sure to wear shoes (think licking a metal pole and this is why they must all wear shoes). The “pool” is just ice cut out from the river and the water has to be heated and poured into the hole. There is an attendant there who fishes out any forming ice with a net. Many of the swimmers seem very happy, and not at all cold. 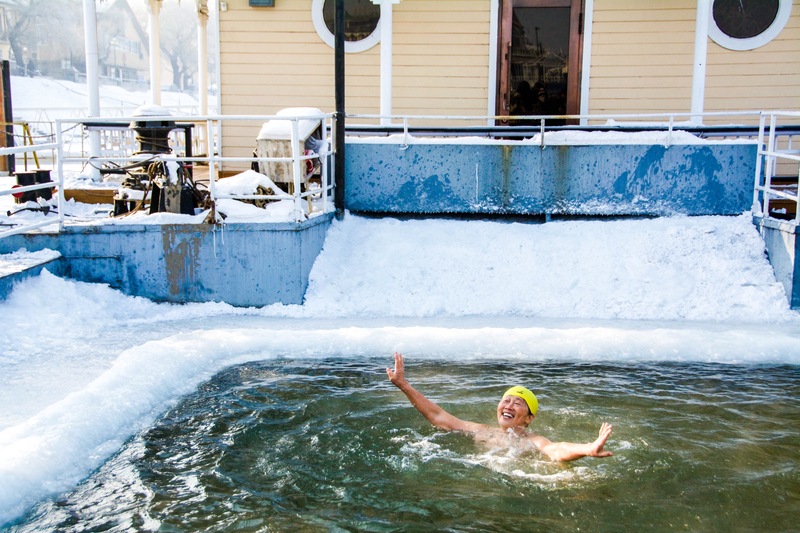 Winter swimming has become very popular and many people nowadays say that it shows the good health and strength of the Harbin people. 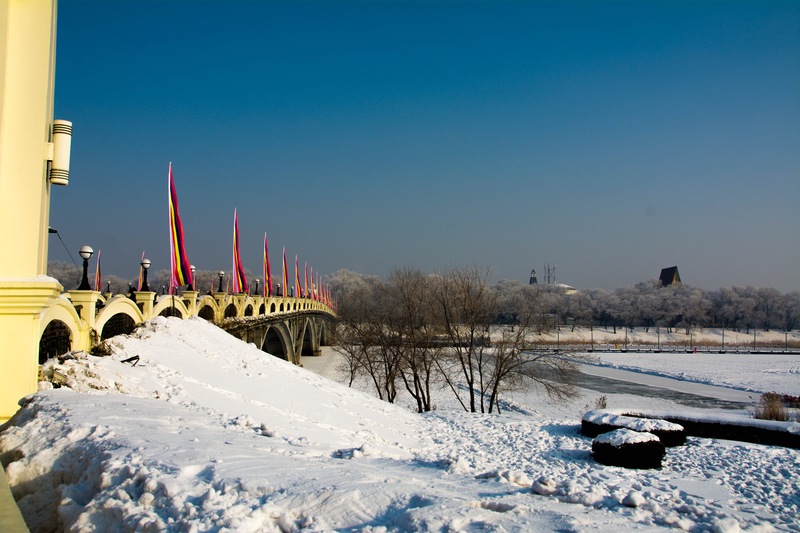 However, our guide told us that ice swimming originated because of the Russian influence in Harbin. 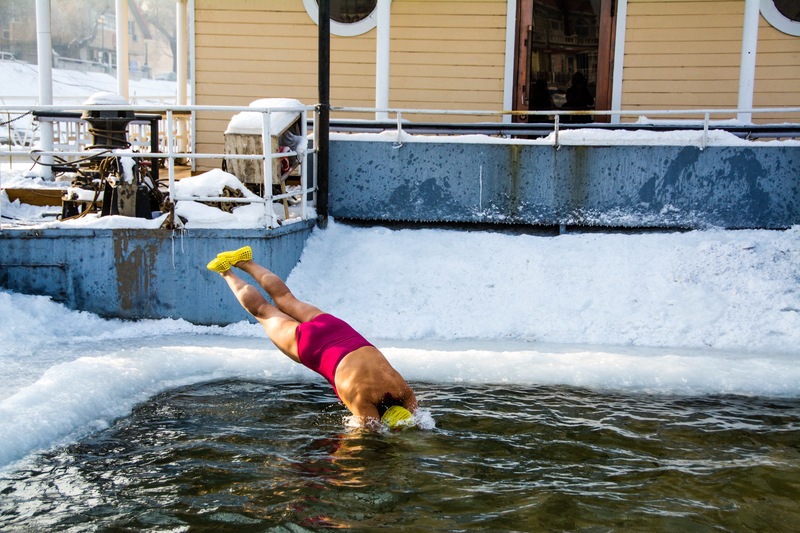 The winter swimming was part of the celebration of the Epiphany, to celebrate the baptism of Jesus. What we watched was just a practice swim, leading up to the official Swimming Tournament that occurs later in the season. We had a great time watching the participants and definitely would recommend anyone visiting to check out the ice swimming events (it was only 50 RMB). There was a 10 am and a 10:30 am showing when we went. In closing, I leave you with this gem of a video that Scott took of a Harbin man soaping up before his big dive into the ice swimming pool, enjoy! Previous Post Shine Bright like a Christmas Light!